Marilyn Cornwell Blog: Was Nancy Reagan a Lunatic? Was Nancy Reagan a Lunatic? The Globe and Mail's moment in history yesterday was about Nancy Reagan telling the press that she was guided by astrology and horoscopes. Wouldn't we call this an alignment of the stars? I hadn't known of the coincidence of the topic. It turns out that the moon is NOT necessarily closer to the earth for a full moon. The Moon can be full and close – supermoon. Or it can be full but farther away – minimoon. Scientificamerica.com asks why the urban legend is so widespread. The article suggests it can be attributed to 'illusory correlations'. This is our mind's propensity to attend to and recall most events better than nonevents. When there's a full moon and something decidedly odd happens, we notice it, tell others about it and remember it. The psychiatrist Charles L. Raison poses the explanation that it is a 'cultural fossil' from the long-bygone era when we slept outdoors and the full-moon was linked to psychological conditions, such as bipolar disorder and most observable then. 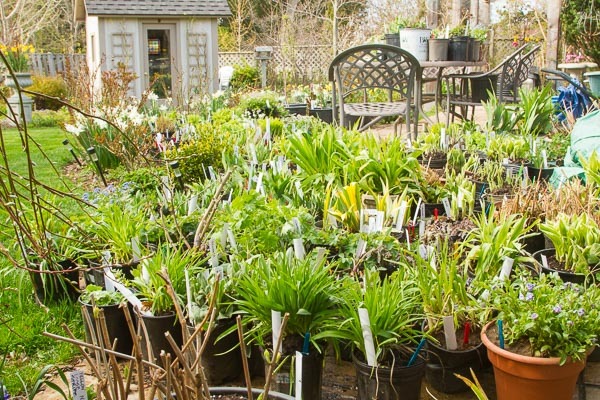 Our picture today is the back garden, packed with plants that will go off to the Grimsby Garden Club plant sale on Friday.